WizKids will release an expansion for its board game based on the sci-fi series The Expanse in February. 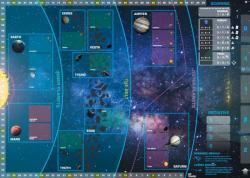 WizKids released the board game version of The Expanse last October (see �'The Expanse Board Game'�). Now it will expand the space opera adventure with five new modules that can be added to the base game in any combination or individually. 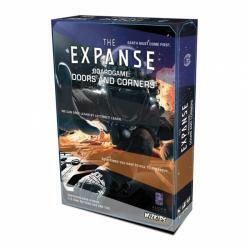 The Expanse: Doors and Corners Expansion includes: Leaders, New Tech, Resource Tokens, Protomolecule, and Variable Setup. Leaders can be added to fleets and add influence. New Tech mixed up the powers that are available, and offers players three choices when it is earned. Resource Tokens can be spent to pay CP cost, add AP to a card, move a player along the initiative track, or score bonus points. Protomolecule has a new scoring opportunity to the game. Variable Setup allows fleets and influence to be placed anywhere when the game starts. The box includes 16 action cards, 36 tech cards, 4 leader standees, 12 power play sector tokens, 12 power play point tokens, 16 resource tokens, 1 suppression token, 1 Protomolecule standee, 5 base destroyed tokens, 1 resource reference card, 1 leader reference card, 1 Protomolecule owner card, and 1 revised game board & ship tokens. As an expansion it requires the base game to play. The game is for 2 � 4 players, ages 14 and up, and plays in 1 hour.